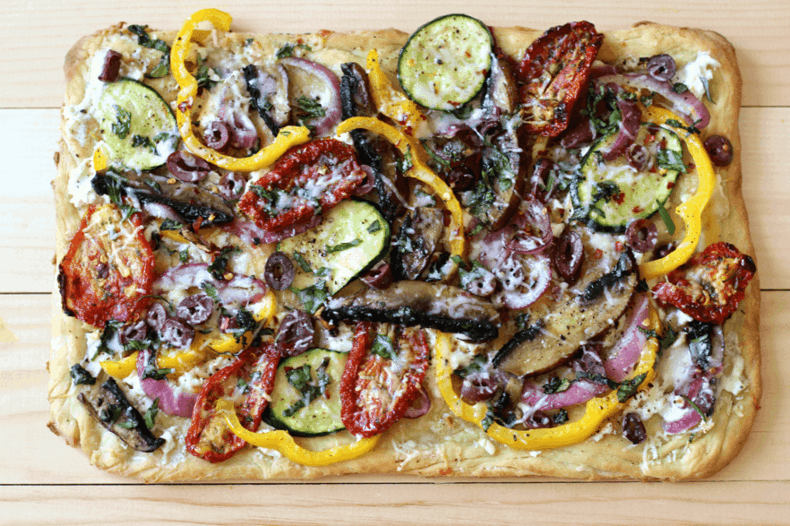 This Roasted Vegetable Flatbread is perfect for entertaining, and has a delicious variety of vegetables such as portobello mushrooms. 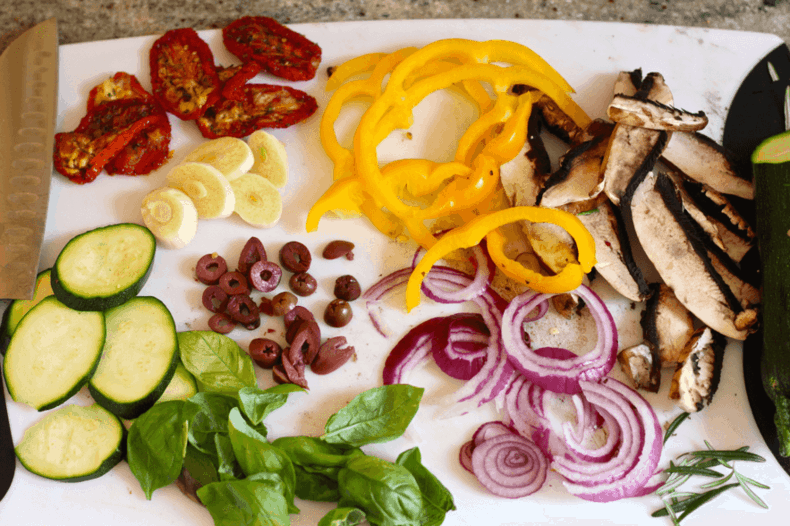 When I went to make this flatbread, I had trouble choosing which vegetables I wanted, and knew that at some point I had to limit myself. But veggies are just so delicious! 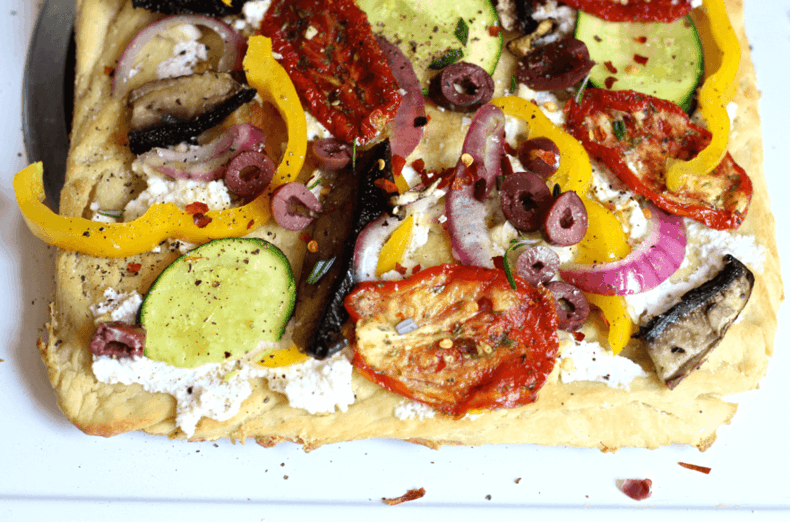 I chose portobello mushrooms, yellow peppers, zucchini, sundried tomatoes, kalamata olives, plenty of garlic, red onions, basil and rosemary, and used a blend of three cheeses – ricotta, parmesan and mozzarella – to make this delicious flatbread. I also meant to throw on some arugula in the end. By that time I figured toppings would start falling off if I added any more. Life isn't always easy, sometimes you have to make some tough decisions! 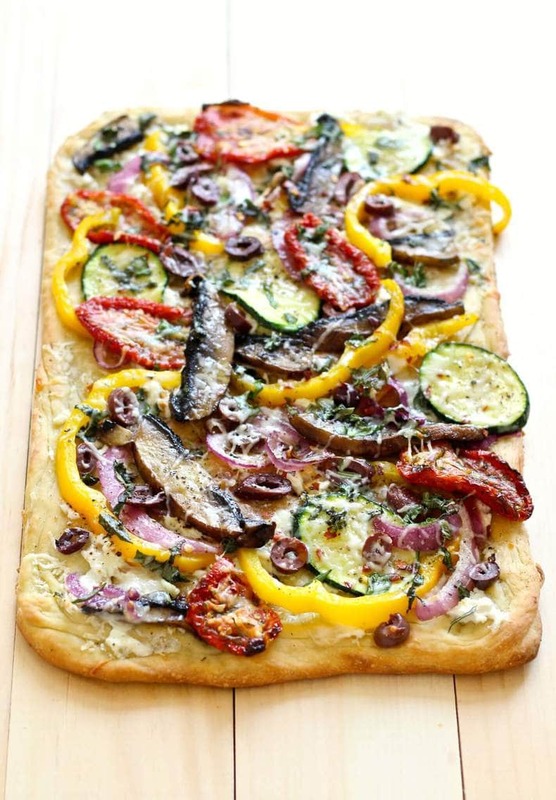 Many of the recipes that I've found online for this kind of roasted vegetable flatbread rely on the BBQ to make an excellent creation, but I'm recommending pizza dough be used in this recipe and that make it very hard to put onto the grill. I've made oven pizza before, and all you need is a 500 degree oven and the right kind of perseverance to make pizza and flatbread at home. 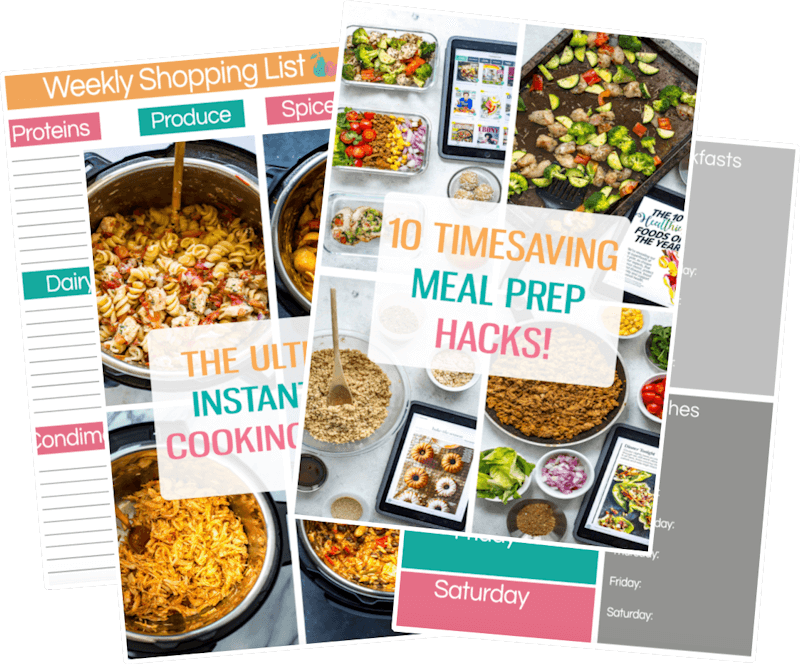 The hard part is not eating everything at once! 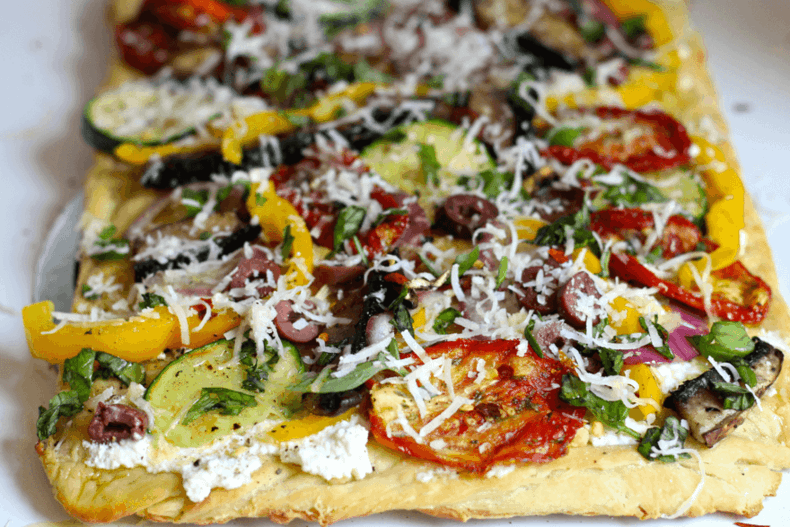 Fresh herbs and garlic make for the perfect finishing touches to this flatbread. Both of the fresh herbs are from the small herb garden on my balcony – rosemary and basil. I added some red pepper flakes for a bit of spice. 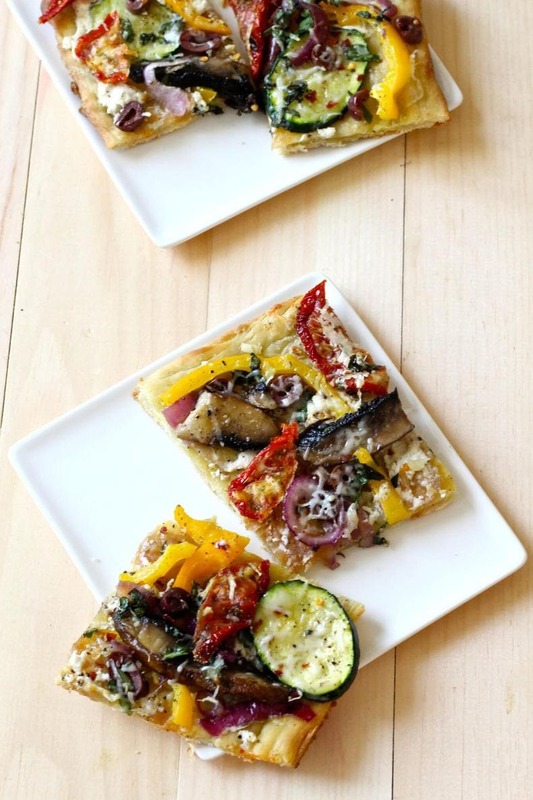 Will you be trying my recipe for this Roasted Vegetable Flatbread? I absolutely LOVE this pizza cutter for this flatbread! 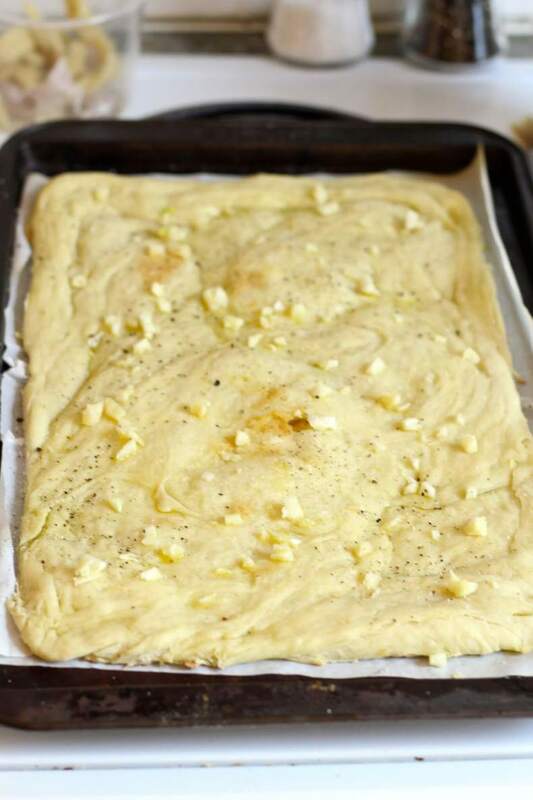 Roll pizza dough out flat, and fit onto a pizza stone (which must be preheated in the oven beforehand) or a regular oven tray. Brush with 1 tbsp olive oil and season with salt & pepper, topping generously with chopped garlic. Cook for 8 minutes. 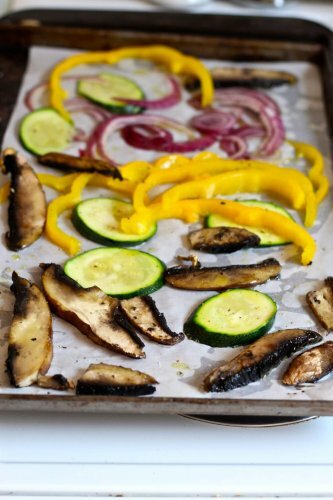 Meanwhile, slice vegetables and season with salt and pepper, drizzling 1 tbsp of olive oil overtop. Cook in the oven for 3-4 min. Once dough is finished, remove from oven and add ricotta cheese as the first layer, then add vegetables, herbs & and other cheeses. Cook for another 8-10 minutes until cheese is melted and pizza dough is fully cooked. Serve right away with a glass of wine and enjoy! Yum! I love the mixture of cheeses that you picked! It sounds amazing, I will definitely need to try it out! 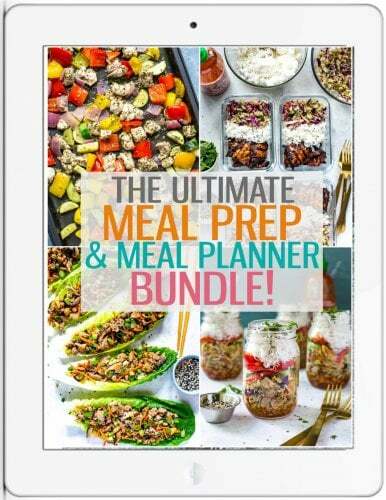 This looks delicious I can’t wait to make this! I’ve been searching for flat bread dough. What brand pizza dough do you use? Hi Lisa – I just buy whatever my grocery store has on hand. It usually comes in a plastic bag and is not branded…just packaged by the grocery store!